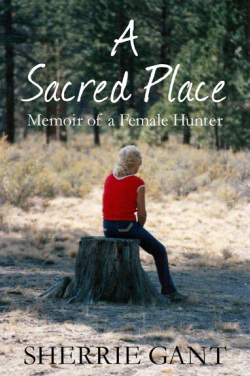 Walk along side Sherrie Gant through seasons of Oregon's High Desert and experience her journey through lessons in life, love, loss and faith at her family hunting camp of over 50 years in her new book, A Sacred Place, Memoir of a Female Hunter. With nearly an all female hunting party, it has become much more than just a place to harvest meat--it's a sacred place meant to explore, entertain and inspire. "I believe that all people have a sacred place where they feel safe, whether only in their mind or an actual physical location. This is my special place, my sacred spot, my mountaintop. I've come here since before my birth, in my mothers womb during her eighth month of pregnancy. For over 50 years we have assembled here... it is the only place we gather. There are no longer buildings here and no amenities, no fluff, no fancy, just precious memories." Grandma sat in the kitchen in her wheelchair with the stub of one leg exposed, her wooden prosthetic cast aside for a time on the old iron bed. I don’t recall her wearing the shiny pink leg that much; mostly I remember the pale naked stump peeking out from under her loose calico dress. _ "Memories are meant not to hold us hostage but to transform us. Sherrie Gant's A Sacred Place does just that. Drawing from her own stories of four generations of women in a western hunting camp, she reminds of the importance of family traditions and how their memories comfort us into belonging." -JANE KIRKPATRICK, Bestselling author of All Together in One Place. "Sherrie's book is an incredible rendition of traditional family life and values, cherished memories, and outdoor adventure times 10! She has the ability to describe each moment in a way that resonates with all your senses allowing you to walk along the trail with her and her family. The togetherness they experienced reminds us all of life's trials and tribulations and how family can hold it all together through the good and bad. We all have our own sacred place...whether it's in our mind, our heart, or in our dreams, and I know that I appreciate "my sacred place" just a little bit more now because of it. Great Job!" "I started out listening to a storyteller, then began to follow you through the woods, and soon walked alongside you on the journey. Thanks for taking me to your Sacred Place. Even more than the way surroundings embrace us, you remind us of how we are held by family and God's grace." "I bought your book for my kindle. I love it!!!! Just started it and don't want to go to sleep I want to keep reading. "- Rhonda P.
"Sherrie Gant's journal of memories of her family's "Sacred Place" in central Oregon reminded me of my own childhood and memories I have not written for my own future generations. I found great enjoyment as I traveled with her and her family through the areas of their annual deer and elk hunt and thoroughly enjoyed the "home" they made at their deer and elk camp. My toes and fingers froze right along with hers as she patiently waited on a frozen log to flush out the game with which her family would be sustained in the coming year. I was impressed with the respect she showed for the animals they hunted, being careful to never leave a wounded elk or deer to suffer but instead would track it sometimes for hours to finish the kill. I admired the expertise she revealed in tracking, something I'm certain would take years to develop. I grieved along with her and her family in the tragic loss of a family member. The pictures I was able to view on this book's Facebook page made it come alive. Sherrie has revealed her artistic ability behind the lens of a camera as she captured the magnificence of God's creation. This is a book anyone would enjoy even if one is not a hunter." Sherrie Gant is a wife, mother, writer, a photographer and a woman of faith. She is a lover of nature and enjoys spending time with family in the outdoors. Sherrie is a native Oregonian and a lifetime hunter and comes from a long line of female hunters. Each year she and her family hunt big game in Central Oregon's High Desert where she resides. As young newly-weds, Sherrie and her husband Dennis moved to remote North Eastern Oregon to help build and establish Best Selling Author Jane Kirkpatrick's home which Kirkpatrick wrote about and published in her first book HOMESTEAD. While living there on the land Sherrie began her writing career as Jane mentored and encouraged. Now an AWARD winning writer and photographer she has published in magazines such as Western Horseman, Practical Horseman and Snowmobile Magazine and her latest is book project Ankle High and Knee Deep (Twodot) which she joins other female writers including Kirkpatrick in this book of essays. Sherrie's creative non-fiction work is meant to entertain and inspire as you experience a journey through the eyes of another. Please take the time to write a short blurb or a long review on Amazon about A Sacred Place, Memoirs of a Female Hunter. Just click the link "Write a Review" and Create Your Own Review.